Kent’s work is characterised by the brilliant colours, authentic detail and whimsical portrayal of the subject. Most of Kent’s limited edition works are done as silkscreen prints, using as many as 200 separate colour plates. She was the first artist to be licensed by the Walt Disney Company to portray Disney theme parks in limited edition prints and was selected as the official artist of the 50th anniversary of The Wizard of Oz, the 15th anniversary of Star Wars and the 10th anniversary of E.T.. 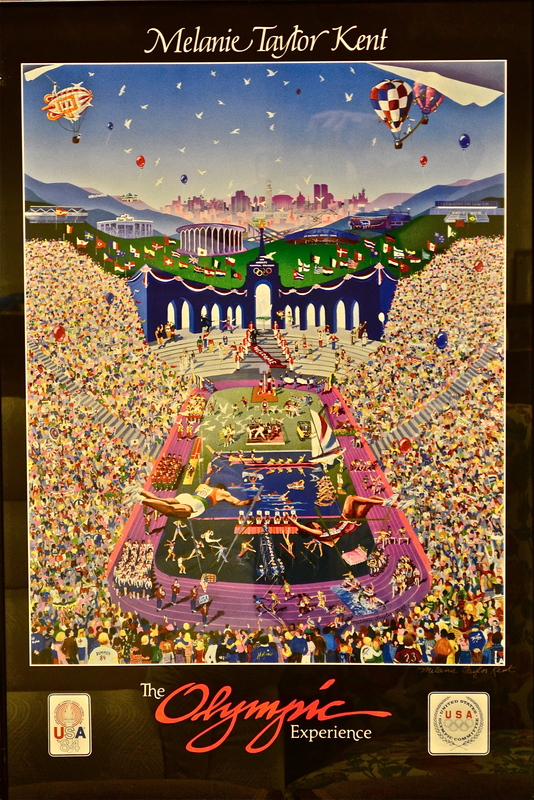 Her depiction of the 1984 Olympics, Let the Games Begin, which depicts almost every event and shows many of the arenas and stadia, was licensed by the US Olympic Committee. Another artist inspired by American – and British – icons is Cheltenham-based Andy Danks, who shot to fame in the 1980s with his portrayals of classic racing cars, often with a union flag as the background. And a number of his striking original paintings will be offered for sale, with estimates around the £50 to £80 mark. 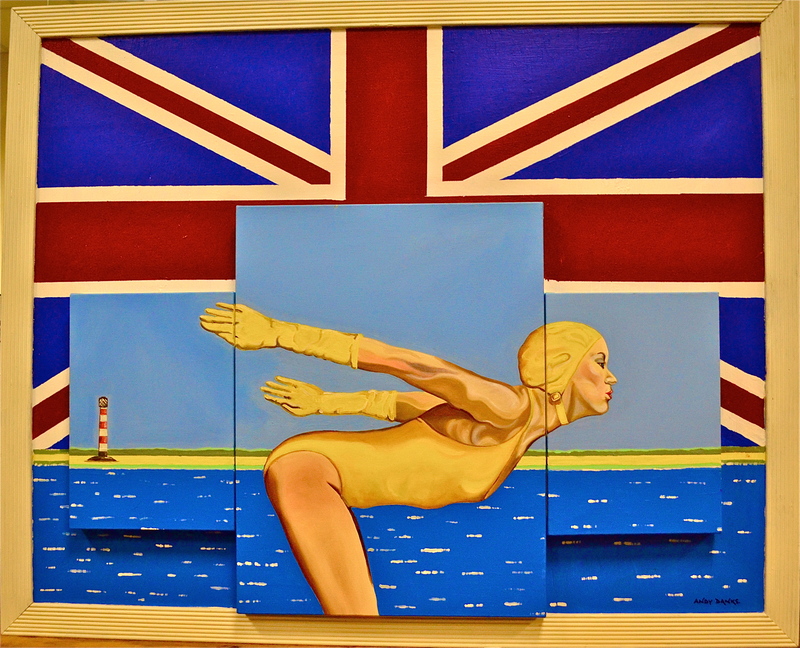 They include White Cliffs, depicting a Spitfire fighter plane; Marigold Diver, a 1930s-influenced scene of a female sportswoman wearing a yellow swim suit and bathing cap and yellow washing up gloves, and three paitings from the American Icon series, which feature iconic images of Hollywood stars including Marilyn Monroe, Jane Fonda and Elizabeth Taylor against the American flag. Many of Danks’ works include a three-dimensional element, where painted canvases are affixed to decorated backgrounds. And nowhere is his use of the third dimension more noticeable than on All American, which features the torso of a tailors dummy with painted stars and stripes bikini attached to an American flag canvas. Another lot in stunning 3D captures events the shook the world 100 years ago – not the re-release of James Cameron’s Titanic, but a set of 200 stereoscopic pictures depicting scenes from the Great War by The Realistic Travels Company, a stereographic publishing company based in London with offices in Toronto, New York, Bombay and Cape Town, which operated between 1908 and 1916. The winning bidder will need a stereoscopic viewer to enjoy the full effect of the images: stereoscopy presents two offset images separately to the left and right eye of the viewer to give the illusion of depth, and stereoscopic viewers come to auction fairly regularly. A bid of £60 to £80 should secure the lot. Just after the end of the Great War a French artist founded a glassmaking company which was at the vanguard of the Art Deco movement. Glassware produced by the company founded by René Lalique in 1920 is still manufactured today, and among the lots going under the hammer is a single owner collection of Lalique glass animals. Among the most striking are a prowling panther in frosted glass, which should achieve £300 to £400, and an unusual amber-coloured bear, which is expected to achieve £400 to £500.